When you’re part of a SaaS pricing company, releasing a free SaaS product has a bit of irony—especially when you’ve aggressively argued about the misuse of freemium before. That’s why when I pitched that we release ProfitWell (our new SaaS analytics platform for Stripe) for free to my co-founders, it took a bit of time to bring everyone around to the idea. 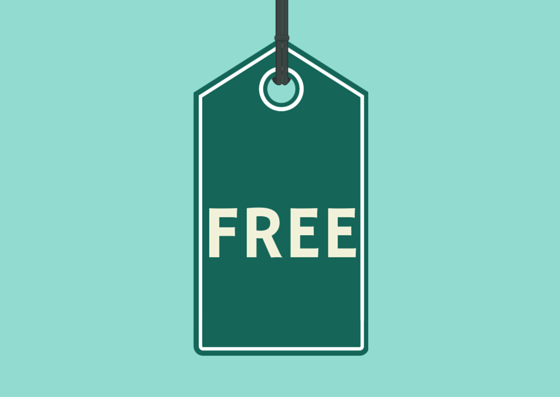 I’m 99.9% sure I won’t lose my job over this though, because in our particular market, utilizing a freemium strategy makes a lot of sense, and it may make sense for you, too. After all, marketing is getting more and more difficult in a sea of ebooks, whitepapers, and sales calls, making customer acquisition more and more expensive. Plus, nothing is better marketing than a real, live product. To further understand how freemium can potentially (and we hope will) supercharge your business, let’s walk through how freemium reduces your customer acquisition cost substantially, before illuminating why monetization is better suited by premium add-ons with value metrics. Acquiring users for any type of product (paid or free, B2B or B2C, etc.) has real customer acquisition costs (CAC), because so many barriers exist between your business and your prospect. First you have to find them, which can be expensive—advertising, marketing, sales—then you have to convince them you’re worthy of their time and money. Can they trust you? Are you worth their time? Will you actually solve their problem? A common reaction to this is: Well, if you have the best product in the market, acquiring users should be easy, right? Well, no, not exactly, because users have no idea you’re better when they hit your marketing site, especially if you’re in a crowded or new space. They probably don’t even know you exist. For instance, look at the SaaS financial metrics market. We fortunately have a quantitative measure of who’s “better” and we’re happy to say that ProfitWell is quantitatively more accurate and provides richer data than any challenger. Yet, do you trust me when I say that without trying the product? In the world of marketing spin and sales, probably not. It’s just B.S. until you see it for yourself. We should just offer a free trial then, right? Well, “seeing it for yourself” has real costs, because even if I give you a trial, there’s still the barrier of potentially wasting your time or not thinking the product is ever going to be worth the price you see on the pricing page. This may make you not even willing to sign up for the trial. We can circumvent this by throwing ebooks, blog posts, and testimonials in front of prospects, but you’ve seen hundreds of these before and every company puts their best foot forward. What’s a young SaaS company to do then? Offer something for free to leverage as wide a distribution as possible. Marketing channels are becoming so saturated in the software space, that the best marketing is a real live product that provides value and an opportunity for revenue down the road. By offering ProfitWell for free, we’re eliminating as many barriers as possible to get someone to sign up and try us out, which should reduce our CAC substantially. What’s also interesting here is that we’re pushing our users into a quasi-customer experience—we’re still going to support the free users, still going to build product for them, and treat them as close to a customer as possible. This interaction helps us move from a monetization path to more of an up-sell path, which is a heck of a lot easier to extract revenue from. Don’t worry; this logic is backed up by data, too. 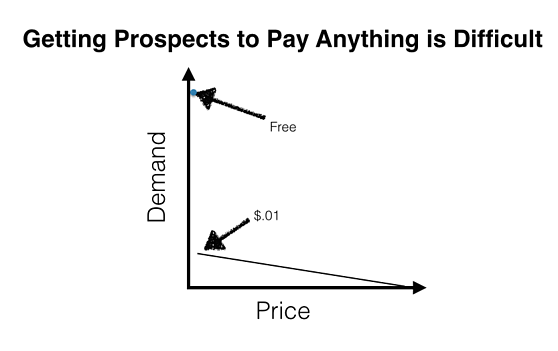 We’ve seen through building hundreds of SaaS revenue models at Price Intelligently that, when done properly, freemium has enormous potential for distribution, because you’re taking advantage of the Penny Gap. As Josh Kopelan at FirstRound points out, “entrepreneurs underestimate the level of effort to getting a user to pay anything.” While we still hone in on our own monetization model, the free offering lowers the barrier to entry enough to bring individuals through the door. We can then keep them warm through a great experience and filter out those individuals who want to take advantage of some extra premium tools to help their business. The bottom line: You can lower your CAC and increase your distribution substantially by utilizing the baseline product as a lead source, similar to an ebook, but one that’s much better and much more valuable to our users. This isn’t just about the Benjamins, though. True, we’re a business, but we genuinely love SaaS and the industry (corny as it sounds). But to continue to do what we love and keep shipping valuable product, we need to stick around. We found that charging for an analytics dashboard wasn’t going to do the trick though in terms of recovering our CAC. Situations like this are the reason you need to consider your unit economics to figure out if what you’re building makes sense within the context of the rest of your business. For instance, with ProfitWell, we have a market (SaaS) that is growing rapidly, but isn’t very large at the moment—SaaS companies are estimated to be around 10,000 in number, but two-thirds of those companies aren’t very large. Our initial pricing tests showed that individuals would be willing to pay an average price of around $50/month for just the dashboard, with the largest customers willing to pay $100 - $300/month. This isn’t great when you start to multiply out the upside, especially when factoring in competitors and difficulty in reaching your customers. This brings up a pretty big point—shouldn’t we just make the biggest and baddest dashboard out there to capture the entire market? Well, we could—and we are continuing to do this—but in our experience pricing other analytics product, a static metrics dashboard, no matter how good or powerful, trends towards a low willingness to pay, even for large buyers. Since we have a goal of building a long term business, we want to make sure we’re also providing long term value to our users and customers. We can’t achieve this by having a high CAC for a lower MRR. As blunt as that sounds, we just won’t be able to achieve our mission of “helping every SaaS company optimize their revenue and learn more about their customer” with this strategy. This is why we’re focused on products with closer ties to value as explained below. Plus, what’s great about the free product in this case is that we can provide enormous value to our community (SaaS companies), which is exceptionally important to our team. This means that even if a company never grows to a point where our premium offerings would make sense, they’re still able to become a better SaaS aficionado. The bottom line: If you’re in an industry where the unit economics across that industry don’t make a ton of sense for long term value, consider a freemium option with your core product that optimizes for premium options going forward. How will we make sure we survive then as a business? Well, to answer this, we need to know a bit more about the business intelligence space. There’s a reason VCs, Angels, etc. hate investing in Business Intelligence tools: they rarely pan out for investors. The ones that do have giant enterprise sales teams and giant enterprise pricing. They need to do this, because of the CAC implications discussed above, but this also leads them to awful pricing structures based on number of users or the size of the customer. Users may work well, but in reality users is a horrible value metric because it reduces retention. For a BI tool to survive and not be an “empty vessel”, we want every single relevant person to use the tool. The justification for charging based on size is that a large company typically “has more to lose” or “cares more about their data” and therefore is willing to pay more. Essentially, you’re taxing the larger company for the same product. It’s the same user; they care just as much; but you’re saying “just because you have more money we’re going to charge you even though you’re getting the same value.” For smaller companies it’s even worse, because you’re congratulating them on growing their business with a price increase. Sure, this can be justified and you can make those price increase emails sound nice, but the other two issues here are: 1. you’re not tieing what you’re charging for to the value they’re getting from the product, and 2. you as a business don’t have a good expansionary value metric. A great value metric, as you may remember from our other posts, is tied to where the customers sees value in your product, expands with the customers usage, and is easy to understand. Users or company size fails these tenets, because I didn’t help the customer make more money through a financial dashboard, so I shouldn’t make more money when they grow unless I can point to where I helped in the process. So how will ProfitWell make money and where should you focus your monetization efforts? Well, there’s another way up the monetization mountain - in our customer development we found that people wanted actual tools that showed them where they were losing money and THEN gave them the ability to recapture this revenue. This implication leaves us with: let’s give away the core product to reduce the friction as much as possible to get users hooked and to provide value to the community. We can then show them where cash is leaking from their business and upsell them on the tools they need to recover that cash. Win for them. Win for us. The bottom line: If you have the opportunity to create a platform with your free product, take it. You’ll be able to then upsell your users more effectively with value metric laden offerings that are tied directly to your customers’ growth or usage. What if people don’t trust us because the product is free: We’re not dealing with a messaging app, we’re dealing with financial data. Even though companies like Wealthfront have been able to still gain consumer trust with a free product and financial data, we still want to make sure we’re overcoming the trust gap. What gives us hope that this isn’t a problem: Because we’ve worked with so much SaaS financial data with startups, public companies, and government institutions our online and offline security practices are stringent. We just need to make sure people “get” this. What if people don’t want to pay for our premium offerings: We obviously need to monetize and have those products coming down the pipeline, but will they be enough to get the bigger accounts to pony up a good amount of MRR. What gives us hope that this isn’t a problem: Our initial willingness to pay studies show that for some of our offerings we'll be able to reach three and four figure MRR, which is great, because it’ll definitely allow us to ramp up substantially on the revenue front. Time will definitely tell, and we’ll keep you updated on the journey. Feel free to sign up for the blog as we continue down our path to helping 100% of the SaaS market. Also, if you’re a stripe customer, check out ProfitWell, for the best SaaS metrics on the market. What do you think? Would a free offering work in your industry?